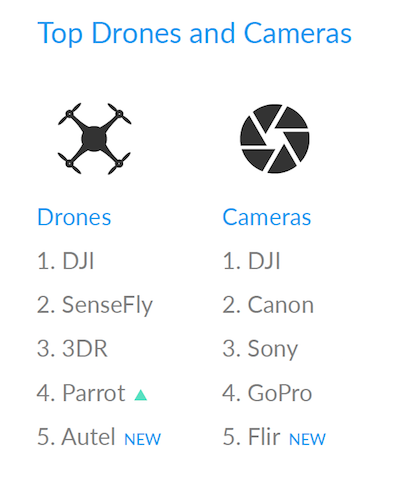 Periodically DroneDeploy publishes an analysis of the drone industry based on data they have collected. It provides interesting insights and worth a read. The commercial drone industry saw significant growth in 2016. Last August, We announced that our users had mapped more than 5 million acres — marking a major milestone for our platform. This February, we reached another milestone: 10 million acres mapped. With 10 million acres under our belt, we have released our third Commercial Drone Industry Trends report to highlight the progress we’re seeing as aerial data continues to provide actionable insights for companies around the world. In this post, we’ll take a look at the evolving industry, and share the trends we’ve discovered from DroneDeploy users who have mapped 10 million acres in more than 160 countries. Companies both large and small are not only integrating commercial drones into day-to-day workflows, but relying on the data drones provide. While adoption has grown universally, there are some clear trailblazers who have arisen since the last report. These industries are particularly ripe for drone integration as they see significant time and cost savings over traditional data capture methods. The latest innovations in consumer hardware make drones more accessible than ever. Newer drones can deliver the performance required to meet business needs at costs that deliver high ROI. More than 60% of active DroneDeploy users are creating maps each week as businesses grow more reliant on drone data. It’s clear that drone mapping is quickly finding its role in the workplace by providing rapid aerial data to fuel faster, more accurate decisions for key business stakeholders. The ease with which drones can capture data is now met with shareability through DroneDeploy’s platform, making it a resource for analysts, advisors and management—as well as pilots. While industry-leading manufacturers such as DJI and senseFly remain the frontrunners, newer companies such as Autel are also making an impact. This is largely due to a growing number of drone pilots operating with multiple drones to meet the needs of their expanding use cases. Currently, 20% of DroneDeploy users are flying multiple drones and this number is only expected to increase in the future. Today, 84% of drone mapping is occurring on drone models that cost $1500 or less. Furthermore, fixed wing drone use has declined to just 3% as it finds its own niche in agriculture, oil, and gas applications where longer range, linear flight plans are more common. Expect to see greater adoption of fixed wing drones if federal line-of-sight regulations are changed in the future. While there is still great need for specialized drones, most mapping occurs using affordable quadcopter drone models. This is largely due to advancements in multi-rotor drone hardware and battery life that was previously only available in more expensive models. Since the passage of the federal regulations such as US FAA Part 107 rule, the industry has seen its largest increase in licensed pilots to date. According to statistics provided by the FAA, almost 29,000 commercial drone pilots have been certified as of December 2016 — with an estimated 2,000 registrations submitted daily. At this rate, the FAA predicts that more than 420,000 commercial drone pilots will be licensed by 2021. As one can imagine, this is having a dramatic effect on local and national economies. By bolstering existing industries — and creating entirely new businesses — drones are generating a lot of economic value for enterprises and entrepreneurs alike. 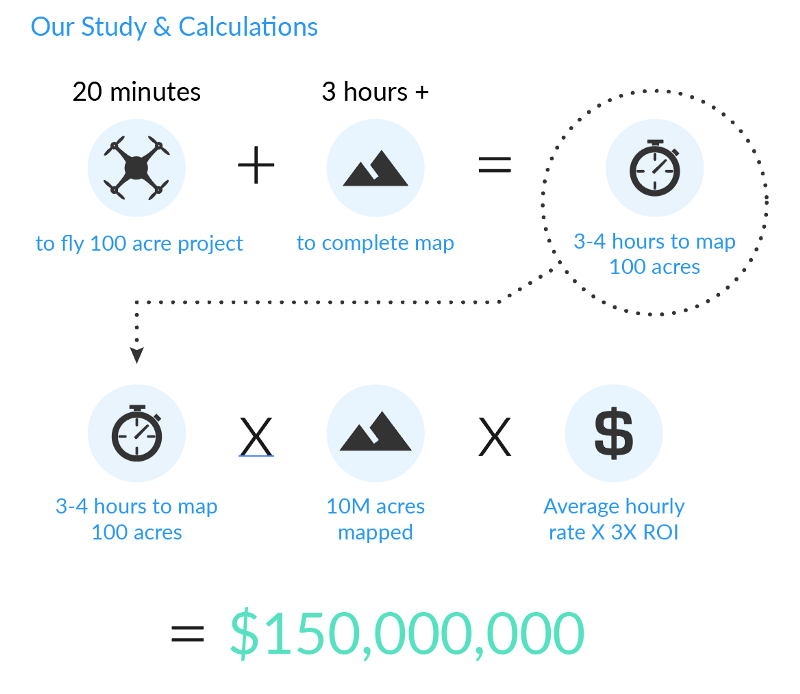 While it’s hard to determine exact value created, by our own conservative estimates DroneDeploy users have generated more than $150,000,000 in economic value to the industry over 10 million acres mapped. Drone Service Providers (DSPs) — who are often contracted to capture drone data for larger businesses — comprise a significant portion of the market. Today, they serve as industry ambassadors, making up the largest group of DroneDeploy users as they work across industries to showcase the power drones can provide businesses. Through a pricing study conducted using data from DroneDeploy and Airstoc, we discovered that service providers who specialize in mapping are earning 16% more on average than those who only offer general photo/video services. Drone mapping delivers significant cost and time savings. Businesses are constantly looking to innovate by improving or replacing inefficient processes, and drones are making this possible. Drone mapping provides 3X time and cost savings compared to traditional land-based and aerial methods. What once may have taken days or weeks can be efficiently captured and analyzed in hours, giving unprecedented insights to businesses in record time. We frequently hear from our customers 3–5X ROI compared to existing practices. Last November, we launched the App Market, giving third-party access to DroneDeploy APIs and the largest drone data set in the world. 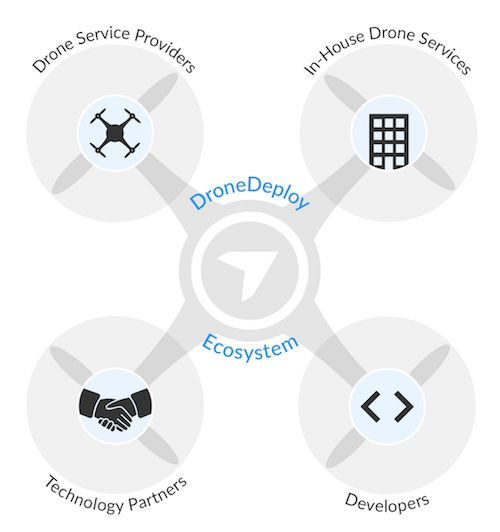 Our goal was simple, to unify the commercial drone industry under one roof by providing the platform to connect developers, hardware partners and pilots with powerful tools to integrate aerial data into business workflows. Just a few months later, the app market is thriving as we see thousands of users amplifying the power of their drone data with third-party integrations — fostering a cooperative ecosystem of innovation. The DroneDeploy App Market creates a one-stop shop for all aspects of cloud-based drone data analysis. With more than 30 apps now available, DroneDeploy users can access industry-leading tools such as Autodesk, MyJohnDeere, Box and others. Since the introduction of the app market, more than 22,000 app installs have occurred. Users can now extend the power of aerial data by leveraging third-party apps within their DroneDeploy interface on both desktop and mobile devices — making it simple to integrate, analyze, and share aerial drone data within their business. This is providing companies with greater efficiency and improved communications, further increasing the ROI on drone investments. As more companies — particularly larger enterprises — embrace drones for mapping and modeling, the app market will be a valuable tool that makes collaboration possible without the need to invest in additional software solutions. Drones are quickly finding their place in businesses. 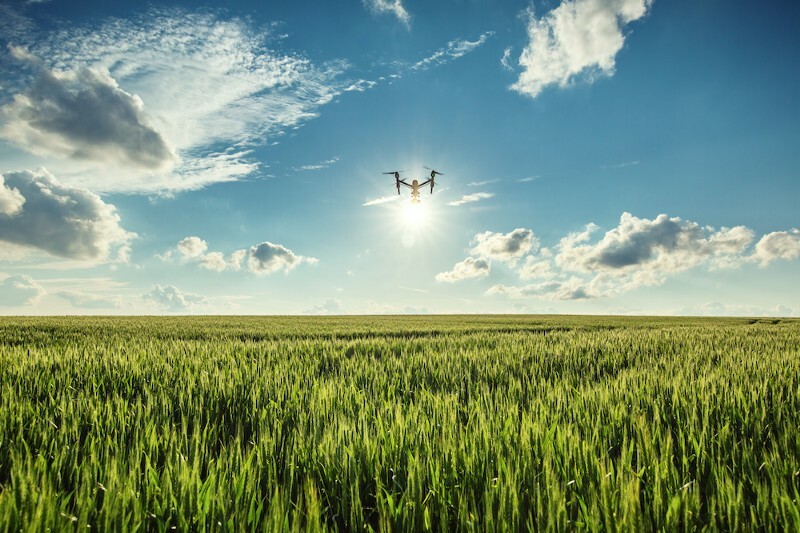 With a clear path to commercial success following the passage of the federal regulations worldwide, adoption rates have soared and major companies are integrating aerial data into their workflows to streamline operations and improve efficiency. While regulatory compliance, safety, and training remain obstacles to adoption, the commercial drone industry has hit a tipping point. Drone impact cannot be ignored. Drones are not just toys for hobbyists. They are powerful data capturing devices transforming the way companies operate — offering unparalleled insight and delivering ROI for companies large and small. In the last year, the drone industry has exploded. This has resulted in thousands of certified commercial pilots entering the industry, and hundreds of millions of dollars being spent on drone services. Drone mapping specialization is generating immense value for companies across industries, and in the coming year we expect larger companies in construction, agriculture, mining, and surveying to heavily invest in these services. As more enterprise drone programs take off, we expect major manufacturers like DJI to continue to invest in premium hardware options. This will have an impact on low-end consumer drone models, ultimately improving the base technology and providing a dynamic range of features and capabilities across the entire product line. A robust commercial drone ecosystem has emerged and will continue to thrive as drone adoption increases. We expect to see an array of hardware and software players enter the industry in the coming year. 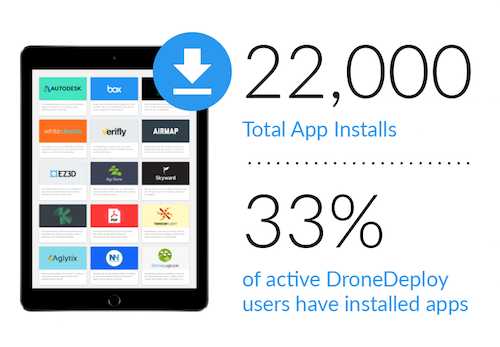 Third-party developers are already making an impact through the DroneDeploy App Market, contributing to thousands of downloaded apps and expanding the features and functionality of the platform. This trend will continue along with the momentum powering innovation in the commercial drone industry. It’s safe to say that drones and aerial data are redefining business operations. With possibility abound, the sky is truly the limit — and DroneDeploy will be here to continue driving innovation by bringing drone data to new industries and use cases for years to come.